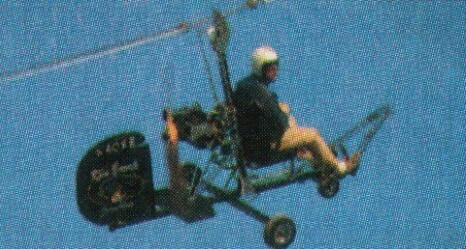 First flown in 1980, the KB-2 Gyroplane has quite a few features that distinguish it from other similar aircraft. These include: an aircraft-type joystick for con-trol; its fuel tank seat which is molded from polyurethane to save on weight and add to the clean-looking design; its choice of rotor blades and its wheels. Construction has been simplified by packaging into seven separate kits (airframe, landing gear, rotor head, rotor blades, rotor hub, joystick, rudder/horizontal stabilizer and an optional kit for a prefab metal tail). Engine: 72 or 90 hp McCulloch, VW, or similar. The KB-2 was sold in sub-kits. Price may vary with options, but the average is $12,500 in 2001. Rotor blades: 22’ x 7” Brock riveted aluminium, adjustable hub. Prop: Brock 48” x 18-20” wood fixed pitch.